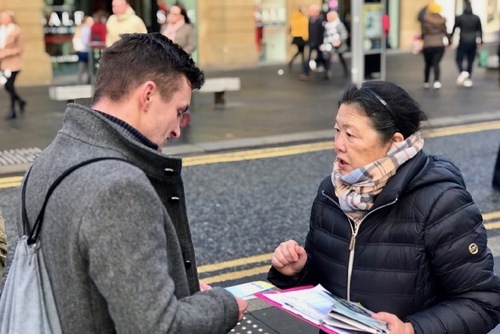 A group of Falun Gong practitioners held activities in the city centre of Newcastle Upon Tyne on January 6, 2019, to introduce Falun Dafa and tell people about the Chinese Communist Party’s (CCP) persecution of the practice in China. Passersby were very receptive and many people signed a petition to help end the persecution. Many passersby paused to talk and read the informational posters, and most signed the petition after learning about the organ harvesting crimes. 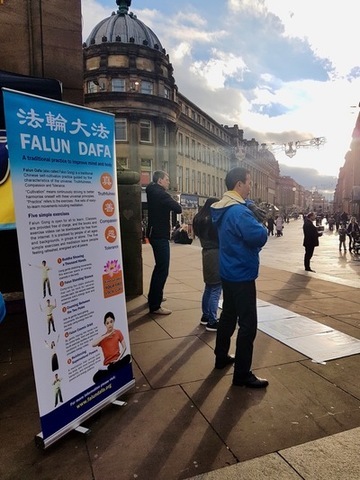 Many local citizens expressed their adamant disapproval of the persecution, especially the CCP’s state-sanctioned organ-harvesting from living Falun Gong practitioners. Several expressed interest in Falun Gong and asked for information about the local practice site. 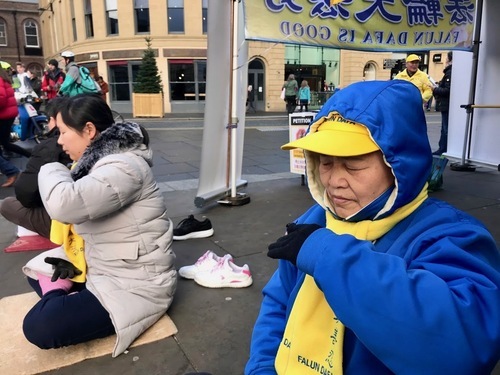 Phillipa, who lives in Newcastle, watched the Falun Gong exercise demonstration and said that she admired the peacefulness that emanated from the practitioners’ movements. She commented that their peaceful energy made her feel truly comfortable and happy. She said that she felt drawn to Falun Gong and said she felt that it could help heal the world and bring peace and harmony if everyone learned the Falun Gong meditation. “The world needs Falun Gong!” Phillipa said.